Posted on December 4, 2017 at 12:14 pm. 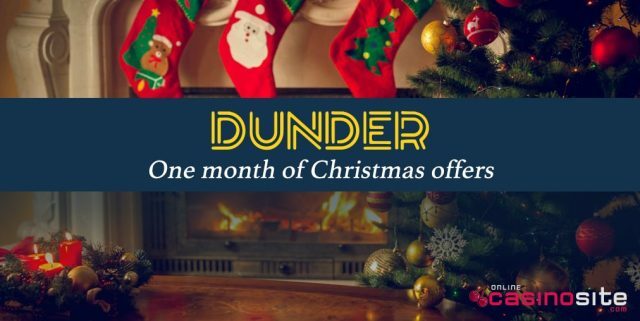 Get into the spirit of the festive season this December at Dunder Casino, where a new promo or bonus offer is available every day of the month, along with a weekly draw with some huge prizes up for grabs. We’re not talking just any old prizes here either – along with free spins and matched deposit bonuses, Dunder is also giving away exclusive Omega watches, a luxurious trip to the Maldives, a weekend getaway to Rome and more. Talk about a Merry Christmas! Dunder’s Christmas Calendar promo is subject to terms and conditions, including a 25X wagering requirement on all bonus money and free spins. Players from Canada, New Zealand, United Kingdom, Netherlands, Finland, Germany, Austria, Norway or Sweden are not eligible to participate in the Christmas promotion. We strongly recommend you read the full terms and conditions of this promo at Dunder.com before taking part to make sure you meet eligibility criteria. Head to Dunder Casino today to join the Christmas bonanza, or you can learn more about what this casino site has to offer with our full review of Dunder Casino.